Mid-City Scrap Iron & Salvage Co.,Inc was born in the 1930s when America was facing economic uncertainty. Our founders turned what started out as a strategic way to make a living during tough times into a scrap industry legacy that is now one of the largest scrap processing firms in Southern New England. Mid-City Scrap Iron & Salvage Co.,Inc in Westport, MA continues to be owned by the Gitlin family, whose roots are firmly entrenched in the same hard-working spirit that helped launch the business nearly 80 years ago. 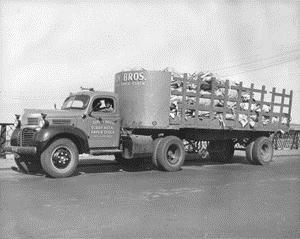 Herman Gitlin purchased his very first truck in 1936 in Fall River, Massachusetts. He used this truck to peddle rags and collect scrap metal in the form of old pots and pans. Herman rented a corner lot in the Flint section of Fall River, turning an old horse barn into a waste paper and rag shop. Eventually he was able to hire employees and extended his business to include the buying and selling of metals. Eddie and Milton Gitlin joined their brother in his business when they came home from the Army in 1946. They expanded the business again, with Eddie starting another shop in New Bedford and Milton working with Herman in Fall River. From these humble entrepreneurial beginnings, the Gitlin Brothers grew their small business into what is now known as Mid-City Scrap Iron & Salvage Company. The brothers continued to work together and saw their business evolve over the decades according to consumer and industry demands. In 1951, the Gitlin brothers purchased more land in Westport, Massachusetts, a run down slaughterhouse on Old Route 6, which connects Cape Cod all the way to New York City and Points West. 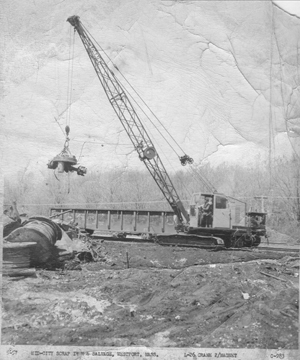 In the 1960s, they worked as laborers, disassembling automobiles for scrap by hand. As new scrap processing machinery and technology became available, the Gitlins added more trucks and embraced the new era of automated recycling. Today Mid-City Scrap Iron & Salvage Company is located in Westport, Massachusetts. His son Louis and Eddie’s son Mark, our little family business has grown into a state-of-the-art processing plant and employs a large team of hard-working men and women from the surrounding community. Mid-City Scrap processes ferrous and non-ferrous metals as well as various grades of waste paper and fiber. We also process materials such as electronic scrap or e-recyclables, materials which are associated with the modern computer era. The raw materials processed at Mid-City Scrap come from a wide range of businesses including small independent contractors, municipalities and even Fortune 500 companies. We work each and every day to reduce environmental burdens caused by waste materials, turning recyclable scrap into new products.